Damaged hair inhibits not only shine and suppleness but hair growth as well. Growing out damaged hair is difficult due to the constant breakage and splitting of your hair shaft. This damage only breeds more damage, leaving your ends frizzy and unmanageable. To regrow damaged hair, you must address and fix the damage, allowing for overall tress health. In addition to taking care of your mane at home, investing in a professional stylist can help repair damaged hair. Shampoo your hair every other day with a botanical infused shampoo. Daily shampooing dries out your hair and causes more damage, thus inhibiting growth. Follow shampooing with conditioner, and condition your hair on days you do not shampoo, thoroughly working through your hair to the ends and rinsing with lukewarm water. Allow your hair to be natural, avoiding use of chemical applications such as harsh colorants, relaxers or permanent waves. Chemicals are known for their damaging properties, increasing split ends and breakage. As the hair breaks, inches are taken off of your hair, stopping proper growth. Pull your hair back loosely with nonmetal hair elastics. 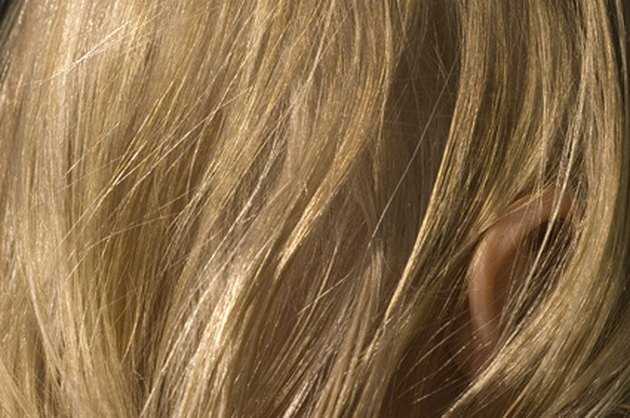 Tighter hairstyles and metal clasps may pull hair out of your scalp. Also known as traction alopecia, this condition severely inhibits hair growth. Visit your hair stylist for a trim every six weeks to eliminate dead ends. Hair should be trimmed with sharp scissors by a professional stylist. Dull scissors further damage hair, leaving growth benefits from monthly trims ineffective. Protect your hair from the sun by spritzing on a sun protection spray or wearing a hat when going outdoors. The sun's UV rays strip the hair of natural protectants. Can Hair Grow From Damaged Follicles?